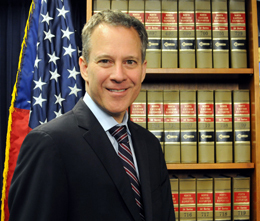 NEW YORK (Legal Newsline) - New York Attorney General Eric Schneiderman announced a settlement Wednesday with a Syracuse mortuary school and its president to resolve allegations of sexual harassment of female students and pregnancy discrimination. Schneiderman's Civil Rights Bureau filed a lawsuit against in 2011 against the Simmons Institute of Funeral Services and Maurice Wightman, the school's president and CEO, after receiving multiple complaints about discrimination and harassment. Wightman allegedly maintained a practice of harassing female students and subjecting students to unwanted touching. The school also allegedly barred pregnant students and teachers from certain activities at the school, even after doctors confirmed such activities were medically permitted. "It's against the law to harass or discriminate against anyone in the workforce or in a school environment - and ts kind of behavior will not be tolerated in New York," Schneiderman said. "Women should not have to endure sexual harassment or pregnancy discrimination, and my office will fight to ensure that no New Yorker is shut out of educational or employment opportunities." Under the terms of the settlement, Simmons and Wightman will pay $30,000 in restitution to students and employees who filed discrimination and harassment complaints. The school will also implement reforms to make sure the school has a fair and safe process in place to evaluate sexual harassment claims going forward. Additionally, Simmons will report future harassment or discrimination complaints to Schneiderman's office.